Elegance. Power. Artistry. The certified pre-owned 2018 INFINITI QX80 for sale in Chicago, IL empowers inclusive luxury as the new symbol of success. Experience spacious comfort and exhilarating force, while indulging your passengers in state-of-the-art entertainment. Expand your awareness with contemporary features for an extraordinary journey. 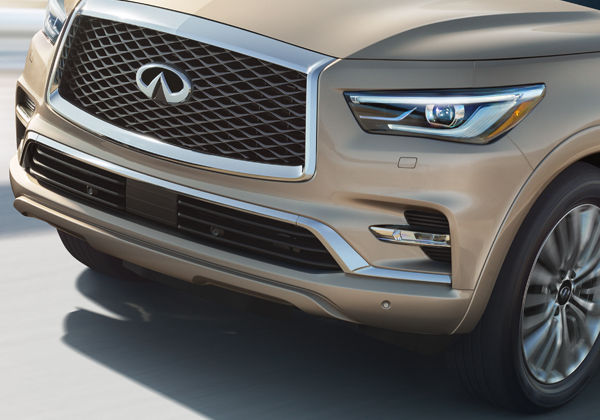 The bold design and agile performance of the 2018 INFINITI QX80 now available at Berman INFINITI Chicago! Proportions as powerful as its performance. 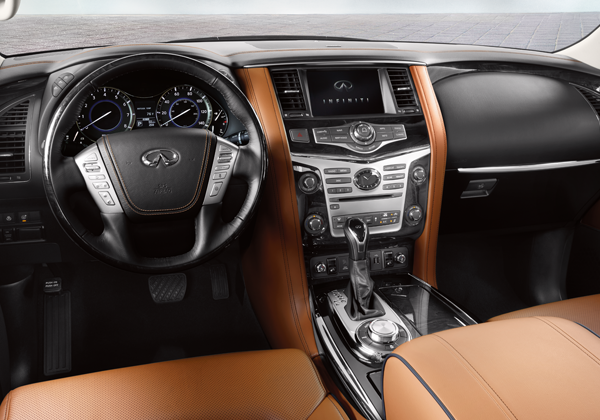 Discover a commanding, uncompromised design today at Berman INFINITI Chicago. Signature LED Headlights – New LED headlights illuminate all driving conditions with an alluring yet familiar focus. Proportions as powerful as its performance. Discover an uncompromised design today! The pre-owned 2018 INFINITI QX80 for sale in Chicago, IL is built on a full-size truck frame and powered by a 400-hp 5.6-liter V-8 with a seven-speed automatic; rear-wheel drive is standard and all-wheel drive is optional. 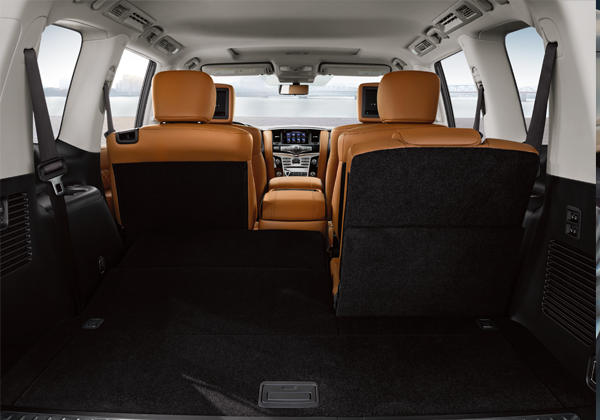 With three-row SUV seating up to 8 passengers has interior upgrades and powerful performance that you don’t want to miss while driving through Chicago in luxury. 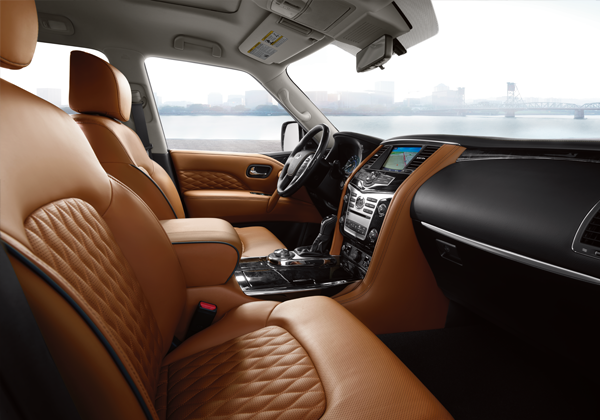 Recline into modern elegance and comfort when you test drive the used 2018 QX80 at Berman INFINITI Chicago. Sharp angles and compelling edges meet new rich materials for a luxurious ride in all seven seats. Seven adults sit comfortably in the available leather appointed, premium 2nd row captains chairs, and eight with the 2nd row split bench option, all with plenty of leg room and personalized climate control options. Set the certified QX80 to AUTO, and relax as power distributes continuously between the front and rear wheels. Or, set to 2WD, 4WD High or 4WD Low to redistribute engine torque, and get adventuring. Extra traction when you need it – safety at all times. Optimal performance on any terrain. Set the pre-owned QX80 to AUTO, and relax as power distributes continuously between the front and rear wheels. Or, set to 2WD, 4WD High or 4WD Low to redistribute engine torque, and get adventuring. Extra traction when you need it – safety at all times. Optimal performance on any terrain. 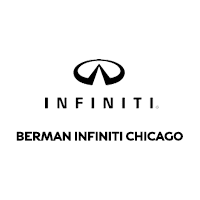 You can visit Berman INFINITI Chicago at 640 N. LaSalle Dr in Chicago, IL to see the 2018 INFINITI QX80. You can contact us to schedule an appointment, or get directions below!